In his 27 years of professional coaching, Ted Sator has been one of the hockey world's premier globetrotters. With the reputation of being an excellent but stern teacher who specializes in building character on fledgling teams and helping turn around struggling programs, Sator has coached throughout Europe as well as making numerous stops in the NHL. 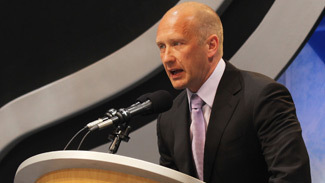 In North America, Sator has served as coach of the New York Rangers and Buffalo Sabres. He was an assistant coach for the Philadelphia Flyers, Boston Bruins, St. Louis Blues, Hartford Whalers and Vancouver Canucks. A powerful voice in USA Hockey, the New York native has been an assistant coach for Team USA as well as serving on the federation's executive board. Sator's coaching travels also have taken him throughout Sweden and Finland, where he compiled nine seasons of experience between the Swedish minor leagues, Elitserien and the SM-Liiga. He won a championship in the Italian league. More recently, he served as the coach of the Slovenian national team, helping the team fight its way from relegation to the top level of international hockey. Traveling to Hungary, he took the coaching post for the Hungarian national team as well as serving as bench boss of Hungary's entry in the Austrian-based Erste Bank Eishockey Liga (EBEL), Alba Volan Szekesfehervar. Now, Sator has accepted a new challenge. Croatian EBEL team KHL Medvescak (also known as the Medvescak Bears) has hired him as coach of the second-season club. Last year, in its first campaign in the EBEL, Medvescak was one of the European hockey world's most pleasant surprises. The underdog team earned a playoff spot, and in a stunning upset, defeated the top-seeded Graz 99ers in six games in a seven-game quarterfinal series. In the semis, eventual champions Red Bull Salzburg (one of the wealthiest clubs in Europe) took out the Croatian team in five games. In accepting the coaching post in Medvescak, Sator acknowledged that his main goal is to help the club take the next steps in its development. There is always the danger of a setback for a team that overachieved the previous season, and Sator's intent is to instill the type of work ethic and discipline that will keep the club moving forward. "There is an established hockey tradition in Zagreb, and the team has a responsibility to all the people that support our team," said Sator. "We all take that seriously. We've got a good group of players and some experienced leaders on the team. I'm looking forward to the season, especially in working with some of the young players." In order to succeed in the EBEL, teams need a strong nucleus of established veteran import players supplemented by homegrown talent. The Bears' roster once again will have a heavy contingent of North American players. Most notably, team captain Alan Letang saw action in the NHL with the Dallas Stars, Calgary Flames and New York Islanders. Forward Joel Prpic played for the Boston Bruins and Colorado Avalanche before becoming a cult hero in Japanese hockey and signing with Medvescak last season. A new addition to the club is former NHL right wing Frank Banham. The 35-year-old has spent most of the last decade in Europe after playing parts of three seasons with the Anaheim Ducks in the late 1990s. Most notably, Banham scored 9 goals in 21 games for Anaheim during the 1997-98 season. He returned briefly to North America for the 2002-03 season, playing five games with the Phoenix Coyotes. Otherwise, he has played exclusively in Europe since 2000, making stops in Finland, Switzerland, Austria and Slovenia before signing this summer with Medvescak. Goaltender Robert Kristan mans the pipes for Medvescak. Although he is just 27, he has considerable international experience with the Slovenian national team and played in Elitserien (the Swedish Elite League) for Brynas and Allsvenskan (top Swedish minor league) for Mora. Ice hockey in the Croatian capital city of Zagreb has a long tradition, spanning 94 years since the first game was played between the HASK (Croatian Academic Sport Club) and PHSD (First Croatian Sport Community). As the only city in Croatia in which the metropolitan population exceeds 1 million people, Zagreb always has been a hub of Croatian hockey interest. Last season, the city celebrated the addition of KHL Medvescak -- Croatian hockey's most storied franchise -- to the EBEL. The original incarnation of the club was formed 40 years ago and had a colorful history. For its first 10 seasons, Medvescak played on an outdoor rink called Salata, which at the time also was the home base of the national program. In that period, ice hockey was the second-most popular sport in Zagreb, trailing soccer (specifically FC Dinamo). On many occasions, FC Dinamo fans would leave the soccer stadium to head straight to Salata to watch Medvescak play. The hockey crowds at Salata often numbered around 5,000. While Medvescak was popular with its fans, they never won the Yugoslavian championship. Until 1991, Croats, Slovenians and Serbs lived in a single country called Yugoslavia, and the Slovenians dominated Yugoslavian hockey, with the Jesenice and Olimpija clubs winning the lion's share of championships. Nevertheless, Medvescak produced some of the best talent to ever play in the former Yugoslav republic. In particular, Croatian players Ivo Rataj, Miroslav Gojanovic and Boris Renaud were regulars on the Yugoslavian national team and played at the IIHF World Championships and Olympics. In 1971, Medvescak finally moved into an indoor rink, Dom Sportova (the same venue in which the new version of the club plays today). The team had an up-and-down existence for the next two decades. The club was in financial crisis in the early 1980s, and barely managed to avoid relegation from the top league in 1985. The next year, the Gortan building company, owned by Zdenko Gradecki, became the team's main sponsor and de facto owners. The much-needed support ushered in a golden era that saw the club win two Yugoslav Cups and bring in Vycheslav Anisin (a member of the Russian hockey hall of fame) to play for the Bears. Championships followed in the 1988-89, 1989-90, and 1990-91. Once again, the club became a top draw, playing to big crowds by European hockey standards. In late 1991, real life intervened. War broke out in Yugoslavia. The country ceased to exist and Croatia became an independent country, along with Slovenia and Serbia. Gorton went bust financially and pulled its support from Medvescak. As a result, the team became an amateur club with no more than 200 people attending its home games. After almost 15 years of darkness, efforts to revive Medvescak took hold. The club's bid to join the EBEL was approved last spring. The Bears ended up being one of the league's most well-supported clubs, playing before passionate home crowds and often packed the house in Zagreb.